On Friday March 3rd, in the evening, the newly formed, Society of Iranian American Health Professionals (SIAHP) had their first Norouz celebration in the Washington, DC area. This event was attended by the professionals in health-related fields and their family members. OMID had the pleasure of being the only represented organization at the event. OMID ambassadors talked to many individuals about our mission and our girls’ medical needs. OMID Foundation is grateful to be recognized by Dr. Jamal Yousefi, the President of SIAHP, during his welcoming speech. We are looking forward to working with this amazing organization in the near future. On Sunday March 5th, OMID Ambassadors Shahab Rahmani and Sarvazad Katouzian set up a table at the Iranian Community School’s Persian Cultural Center Nowrouz Celebration at Fairfax High School. They spent the day handing out OMID informational pamphlets to patrons as well as educating the community about OMID’s activities and how they can help. They were able to gather contact information from individuals who were eager to help out and they also collected some donations. This event was a success as many people had not heard of OMID before and were excited to learn more and help. On Saturday March 11th, On March 11th, Persian Student Association (PSA) at the University of Maryland Baltimore County (UMBC) held their Nowrouz event and once again represented OMID. The representative of PSA read a statement in both Persian and English which gave a background about OMID and its mission. A short video was played followed by the PSA representatives asking the guests to celebrate the New Year by donating to OMID. OMID ambassadors were able to build connections with the guests and raise awareness and funds for OMID’s young women. OMID Foundation is grateful for the PSA’s efforts. On Sunday March 12th, our OMID volunteers Delya Delyavari, Gohar Farahani, Golnar Fekriershad, Narges Fekriershad, Amir Golalipour, Marjan Irannejjad, Safoura Kashfipour, Ava Omidvar, Sarvazad Katouzian, Shahab Rahmani, Hirbod Sajjadi, and Alexander Hancock, all braved the cold weather and headed to Tysons Corner Center at 9 am in order to speak to a hopeful crowd looking for Nowrouz items, gifts and activities for their children to participate in. The OMID table offered free chrildern’s face painting, Nowrouz cards made by the young women at the OMID Center in Tehran, DVDs, T-shirts, an Instagram photo booth and Women’s Empowerment laminates to pose with to increase our social media followers. By 5pm, these innovative activities had attracted over $600 in funds and 50 new contacts to foster new relationships. Compared to results from March 2016, our fundraising and crowd raising increased by 200%. We could not have done it without our supporters’ enthusiasm, passion and willingness to give at such a beautiful time of the year. Thanks to you all our young women will be able to enjoy Nowrouz 1396 with Eidi! Eid-e Shoma Mobarak! Thanks to the Nowrouz Festival organizer, Ms. Shohreh Asemi, who has been working hard for the past few years for offering the festivity and connecting the visitors to the non-profit organizations and businesses. 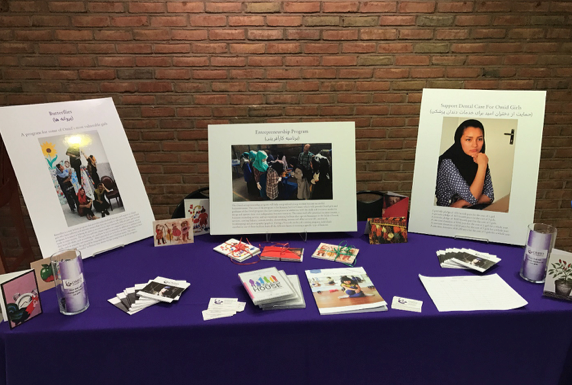 On Friday March 17th, the Iranian Students’ Foundation (ISF) at University of Maryland held their annual Nowrouz event and while doing so, held a silent auction to raise money for OMID. In addition to the auction, attendants got a small presentation about OMID, and what we do. This encouraged some participants to donate money in addition to purchasing items from the silent auction, which allowed ISF to raise close to $400 for OMID!